When I first saw Earlscliffe with its five acres stretching down to the sea in 1969, I knew that the site was favourable for plant growth. There, in the shelter of well-established wind breaks, many tender plants were flourishing including Pittosporum tenuifolium , Olearia paniculata and Cordyline australis. First line of shelter provided by Hebe, pine, Cordyline australis (above) and Cupressus macrocarpa help to deflect wind over the garden. Thirty years on, I now realise that the microclimate is even more favourable than I first thought. At present the garden contains a rich and varied repertory of plants that I had previously assumed impossible to grow at 53 ° N latitude. Among the surprising survivors are Protea species from South Africa, the blue backed tree fern Cyathea dealbata from New Zealand, the Bunya Bunya (Araucaria bidwillii) from Australia, Aeonium species from the Canary Islands and the rare palm Juania australis from the Juan Fernandez islands. Any credit I am given by visitors for the richness of the planting is entirely misplaced as plants are simply put in the ground and allowed to do their own thing without the aid of fertilisers. The natural topography of the site with its southern slope and proximity to the sea does much to ameliorate winter temperatures and provides good conditions for plant growth. A further asset is the 180 metre high Hill of Howth to the north, which protects the garden from the coldest winds. In addition I owe a debt of gratitude to the many owners of Earlscliffe in the century before I arrived for the windbreaks they established. While the sea provides coastal gardens with an extra few degrees of warmth during winter months, it also means that they are more exposed to the ferocity of the wind at all times of the year. Winds blowing directly in from the sea have no obstacles to slow their progress and can be exceptionally violent. In addition, they are often laden with salt, which is particularly damaging to young foliage. When I arrived in 1969 many different species were being used as shelter hedges, both around the perimeter of the garden and also as internal hedges surrounding lawns and flower beds. The main species used as external hedges were Hebe x fransiscana, Escallonia macrantha and Euonymus japonicus. Internal hedges consisted mainly of Olearia macrodonta, Griselinia littoralis, Escallonia macrantha and Fuchsia magellanica. Additional shelter was provided by trees such as Monterey Cypress (Cupressus macrocarpa) and pines including Pinus nigra, P. contorta and P. radiata. Either through good advice or expert knowledge the shrub and tree species already planted for shelter were all suitable for this purpose and I had no reason to make any major change to the external hedges. I have, however, introduced a few plants of Olearia traversii where additional shelter was needed and removed a few trees to enhance the view of the sea. None of the existing shelter plants has ever been damaged by frost even in the exceptionally cold winters of 1978/79, 1986/87, 1995/96 and 2000/01. An effective shelter plant in a coastal area needs to tolerate salt as well as wind. Many plants that withstand salt-laden winds most successfully have evolved in places like New Zealand or coastal areas of South America where they are frequently exposed to salt in the air. They have developed various protective measures against salt injury either by producing light coloured foliage or thick, glossy leaves. The characteristic grey or silver colour of many good shelter plants is due to the blanket of fine hairs covering one of both surfaces. Salt droplets never reach the vulnerable leaf surface as they are trapped between the hairs and are washed off later by rain. Similarly the thick cuticle, the deposit of waterproof, waxy material on the foliage of many wind resistant plants, such as Euonymus japonicus, also prevents salt from reaching and damaging the leaf tissue. Apart from its thick cuticle, the genus Hebe has evolved a further clever method of protecting the youngest leaves from the harmful effects of wind and salt. The growing tip is held for a time in a clasping, protective sheath formed by a pair of young leaves before they expand fully. The three main species providing the first line of defence at Earlscliffe are Euonymus japonicus, Escallonia macrantha and a Hebe hybrid that resembles a tall growing Hebe x fransiscana . Located right on the edge of the garden where the land begins to fall steeply down to the sea 30 metres below these three plants stand up well to the fiercest of winter gales. I like to think of my garden as being the ultimate in labour saving and I am pleased that the Hebe and Euonymus are shaped by the wind and require virtually no pruning. Occasionally I remove a wayward branch but the wind does practically all the work without making the hedge look unsightly. Hebe x fransiscana never shows signs of wind or salt damage. Hebe x fransiscana is a group of garden-raised hybrids between H. elliptica and H. speciosa. 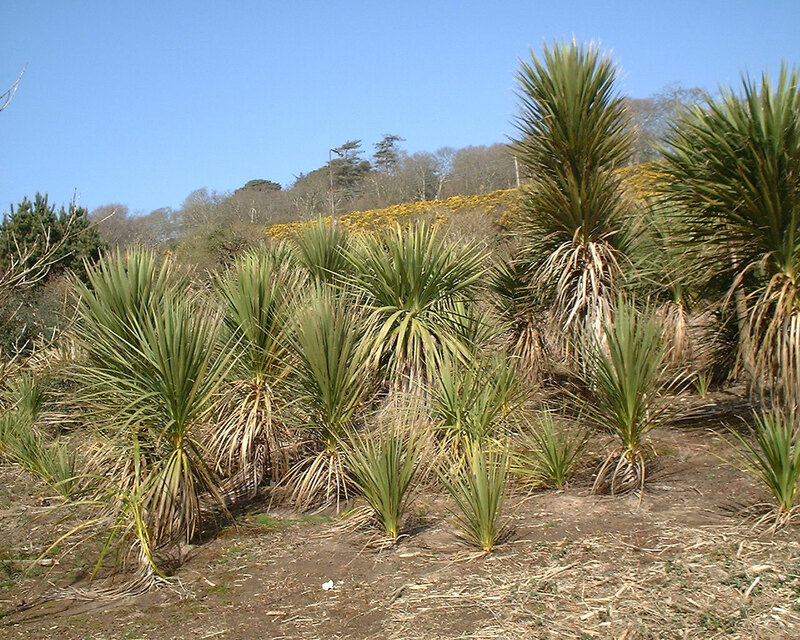 They have a dense, hummocky habit of growth but are seldom more than 1.2 metres tall. The hybrid at Earlscliffe has the same wind deflecting properties but is much taller and never shows signs of wind or salt damage. It starts to flower in March and blossoms spasmodically during the spring months usually giving its best display in July and early autumn. The flowers are violet blue and fit in well with the prevailing greys and blues in a maritime situation. In contrast to the bluish sheen and obvious flowers of the Hebe, Euonymus japonicus has dark polished, green leathery leaves and inconspicuous blossom. Despite the absence of flower colour, this native of Japan is an attractive and cheerful evergreen that seems to relish the sea air. It is liable to frost damage in cold areas and is not suitable for planting inland. Escallonia macrantha owes much of its salt tolerance to the thick cuticle on the upper surface of the leaves and to the numerous resinous glands below. These provide additional protection against wind and salt and make this South American plant one of the best all round for providing shelter in coastal areas. As well as being a first class shelter plant, Escallonia macrantha can also provide a good show of bright, rosy red flowers among rich dark green foliage provided it is not clipped hard. It grows more vigorously than the other species and low-lying branches layer themselves readily. Left to its own devices, this greedy plant can make a wide-spreading shrub and needs to be chopped back occasionally. Another good shelter plant for coastal areas in Ireland is Olearia macrodonta, sometimes referred to as the Australian Holly. This is a good example of the chaos caused by common names for it comes from New Zealand and is a member of the daisy family Compositae, having no connection with holly although its wavy leaf margins are furnished with coarse sharp teeth. It produces large flower heads in June and July which, in some years can be so profuse that the bush looks like a white hummock. Olearia traversii, from the Chatham Islands, is one of the toughest and best shelter plants for exposed seaside gardens. In time it can make a tree 7 or 8 metres high but it can be maintained as a hedge by appropriate pruning. The leaves are green but the undersurface is covered with a dense mat of light coloured hairs so that in wind the foliage flashes white against the sky. Another New Zealander, Griselinia littoralis is completely hardy at Earlscliffe but can be severely damaged away from the coast in hard winters. It can make a handsome hedge with light green, leathery leaves but experience elsewhere in Ireland suggest that it can be susceptible to root rot if pruned hard. Many of the plants used for shelter have inconspicuous flowers and are more useful than decorative. Fuchsia magellanica is an exception for its magnificent red and purple flowers last over a long season and are surprisingly tolerant of wind. Although largely leafless during the winter, its twiggy growth is an effective wind sifter. Olearia paniculata stands up well to wind and salt. In 1995, I was fortunate to be able to acquire another 1.6 hectares (four acres) of land on the eastern side of the existing garden. Unlike the original purchase this plot was completely open to the Irish Sea and in urgent need of protection before any serious planting could be attempted. The shelter species I selected for this purpose was Olearia paniculata. I picked this Olearia for two reasons. Firstly, because it is a superb, wind resistant plant, well known in mild seaside gardens in Britain and Ireland; secondly because it is a prolific self-seeder where conditions are suitable. These seedlings have to be removed before they get so large that they damage other plants and so I had many fine young saplings to choose from. In this way, I was able to put my ‘weeds’ to good use. Olearia paniculata is normally a shrub or small tree up to 6 metres high in its native New Zealand. In Ireland it grows much taller and the late Alan Mitchell, who spent much of his later life measuring trees, recorded several well over 15 metres tall in neighbouring gardens on Howth. While I am completely happy with the external hedges established by previous owners, I was less pleased with the extensive range of internal hedges. The main disadvantage of these was that clipping and disposing of the trimmings would take up more time than my wife and I had available. The solution was drastic but effective. All the internal hedges were cut down close to ground level and the space freed used for colourful, wind resistant plants that would provide interest without the chore of time-consuming clipping. Plants used for this purpose include Pittosporum species and cultivars, Olearia spp and Metrosideros robustus. This strategy worked well as the garden is now not only more colourful and interesting but the time involved in maintenance has been reduced to a low level. 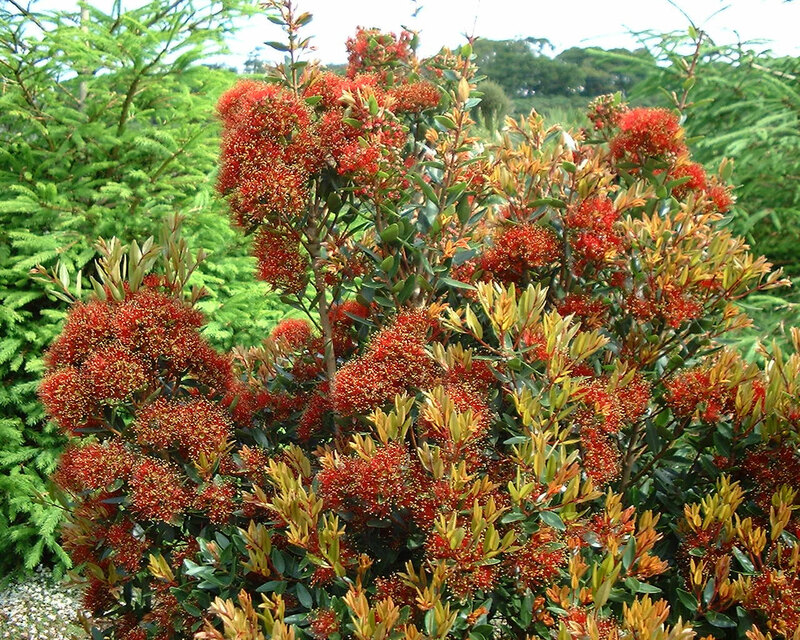 Metrosideros robustus is highly wind and salt resistant but is only suitable for mild gardens. 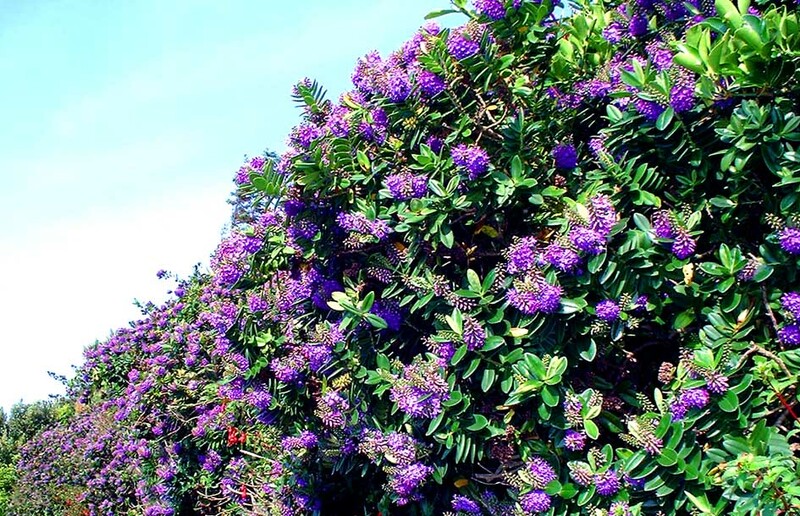 Metrosideros species are worth considering for mild coastal gardens as these are both wind and salt resistant and often grow naturally by the sea in New Zealand. The genus includes several of the most decorative and wind hardy of all the trees and shrubs that will grow in these islands. Unfortunately M. excelsus, the finest and perhaps the most magnificent plant in the New Zealand flora, is marginally hardy at Earlscliffe. It comes through mild winters, such as 2002/03, without any sign of cold damage but severe winters can cut it down to ground level although it sprouts strongly again from the base. M robustus (Northern Rata) and M. umbellatus (Southern Rata) are more hardy and can also provide a brilliant display of scarlet flowers during the summer. Undoubtedly, an Irish coastal garden brings with it inevitable disadvantages of wind exposure and salt burn, but these problems can be simply alleviated by the selection of appropriate shelter plants. And when protective screens are in place, the opportunities for growing a wide range of the world’s most beautiful plants is enormous.